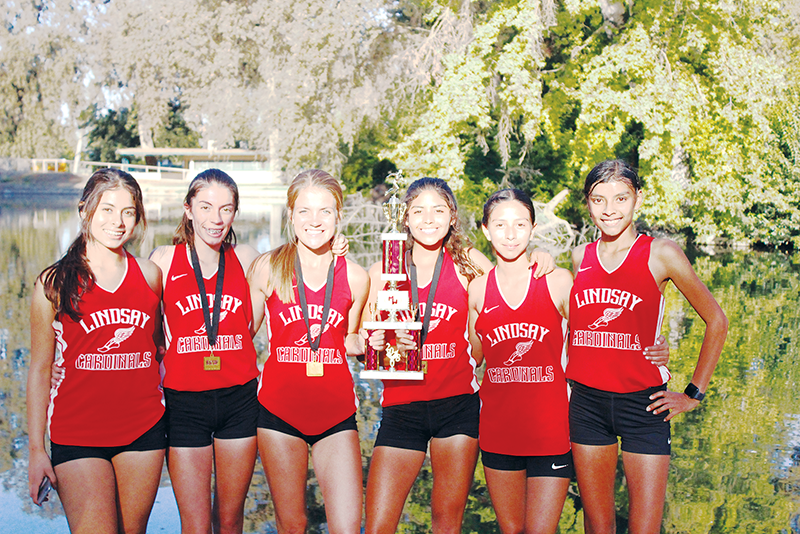 VISALIA – The Lindsay Cardinals girls cross country team has built on last year’s appearance at the state championship. They won their first East Sequoia League meet over the perennial powerhouse Corcoran Panthers, and last Friday took second in the Mt. Whitney Invitational at Mooney Grove Park with a score of 92. McKaylie Caesar rounds a corner on her way to a third place finish. Photo by Patrick Dillon. Caesar came in as the Cardinals’ top finisher with a time of 18:56.69 minutes which was good enough for third place. The top two positions went to Corie Smith of Buchanan (17:25.31) and Olivia Herrera of Clovis (18:46.11). The stiff competition along with the heat played huge roles. In true Caesar fashion she got off the starting line fast and tried to keep pace with Smith. However, the defending D-I State Champion had other plans, and by the time the two runners descended the courses only hill at the halfway point, Caesar trailed by 27 seconds. In the back half of the course the 95-degree heat began to wear her down, and that is when Herrera over took her. While Caesar may not have been pleased with her performance her ultimate goal is once again qualifying for state this season. Going up against a seasoned runner in Smith this early in the season gave Caesar a taste of what the competition is going to be like in November. “I just need to keep working hard in practice and I will get there,” Caesar said. It took an entire team effort to achieve their best finish at an invitational this season. Lindsay had three runners finish in the top 25 positions. Nancy Vasquez joined Caesar in the top 10 at seventh place after finishing with at time of 20:42.88. Brianna Amador finished 23rd with a time of 21:50.76. Belen Ferreira clocked a 22:35.03 for 36th place. Jeanette Ramirez clocked a 23:17.09 for 48th place. Esmeralda Cisneros clocked a 25:10.61 for 73rd place. “The girls are young and new and have just caught fire,” Lindsay head coach John Dixon said. The Cardinals boys’ team had their best finish of the season as well at Mooney Grove. A tenth-place finish with a score of 261. The other five foothills area schools had some decent finishers in the race as well. Exeter’s Rosalind Dixon recovered from a slip at the beginning to clock a 22:35.11. That was good enough for 36th place. 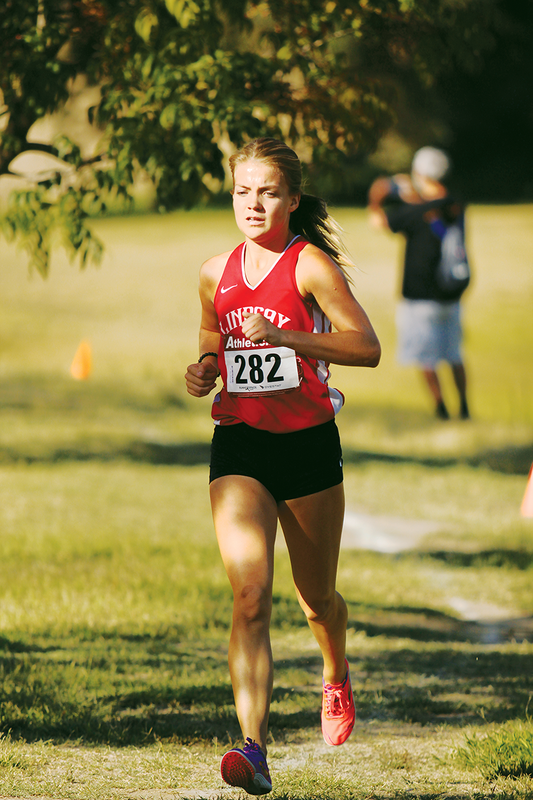 Golden West almost broke into the top 10 positions with Cadence Estermann at 11th with a time of 20:55.71. Erica Munoz was Strathmore’s best finisher in 70th place with at time of 24:56.76. Julia Gamino of Woodlake finished in 88th place with a time of 26:24.39.